I really liked the elimination games we have here, so I randomly created a bracket with every Coldplay song on here, without some demos, the cover versions, etc. It'll be like the other elimination games, except 1 v. 1, then when one wins, we go on to the next match, until we fill out the entire bracket. For those who don't know how to play an elimination game, here we pit 1 Coldplay song against another one. Each start with 10 points. Then each poster will add 1 point to the song they prefer and subtract 1 from the other. You can only post again after 2 other people have posted before. When one song reaches 0 points, the other wins and goes on to the next round of the bracket. The "BYES" are empty spots, so some songs got a free pass into the second round. 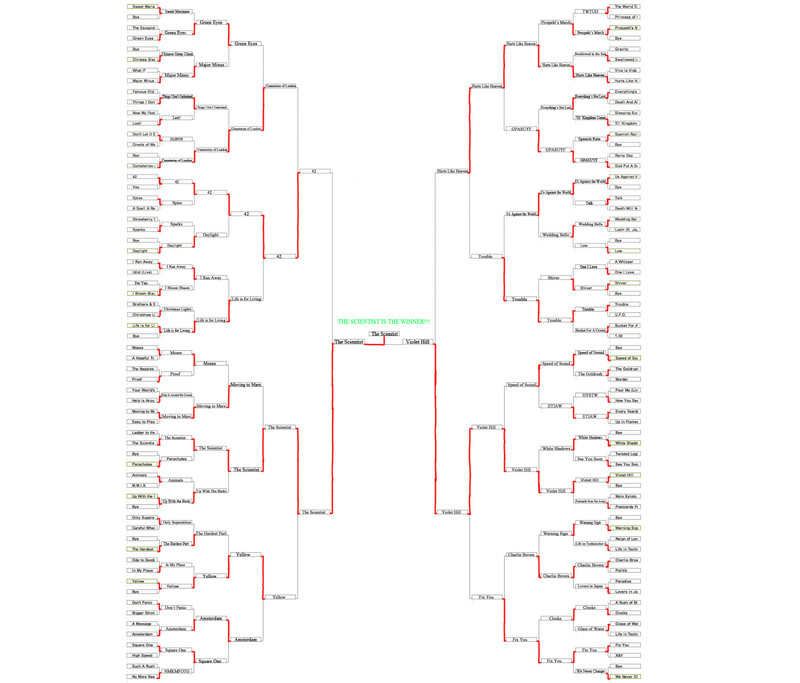 THIS WAS A RANDOM BRACKET, SO I'M SORRY IF SOME OF YOUR FAVORITE SONGS GET ELIMINATED EARLY. I'LL UPDATE THIS PICTURE FOR EVERY ROUND WE DO. Again, wait until at least 2 ppl have posted until you post again. I love both songs but I can't just let this be a too easy win.